Imagine a world better than this one. A world in which we have shed our agonies, anxieties, and bigotries. A world in which “no homo” is not a juvenile invocation of homophobia but rather a polite way of informing aspiring wordplayers that they didn’t quite hit their homonymic mark. (Close, but…) I invite you on a journey to a higher plane of existence: The Kingdom of Homonymy is within our grasp! But first let us take stock of the dreary present. Ours is a world of famine and war, of oppressions both new and longstanding. It is a world in which much does not make sense. To appreciate this, we need look no further than the New York Knicks. Why, just last season, they traded two second-round picks and one first-round pick for Andrea Bargnani. No world in which this happens could be called just, or good, or kind. In truth, the Knicks have not made sense for well over a decade. And who even knows what a Knickerbocker is? According to the Internet, it’s some kind of pants, but etymologically, it comes out somewhere in the neighborhood of “Undergarment Goat Thing.” It is such a gibberish term that the team has practically abandoned the “erbocker” part of it altogether. The solution to our problems? The New York (K)N(I)(Y)(C)(H)(K)S, a new sublimity, a sublime homonymy, a beacon for our time. The Bulls get their man; The Magic get a great defender; The Blazers get wins. But most importantly, the Knicks get two Niks, a Nic, and a Nich. The Celtics need someone to approximate Rajon Rondo for the rest of the season. Iman Shumpert is known for his defense and has a repaired ACL. Kelly Olynyk, for his part, has ‘Nyk’ right there in his name. The Thunder add scoring, length, and athleticism. The Timberwolves free up cap space for free agents. The Grizzlies get quicker. The Knicks add two Nicks and an additional Nik. The Rockets improve their title hopes; the Lakers free up cap space for free agency; and the Kings add Andrea Bargnani, who will help their defense play four-on-five, per visionary owner Vivek Ranadive’s imperial will. Most importantly, the Knicks add two Nicks, a Nik, and a ‘Nik’. 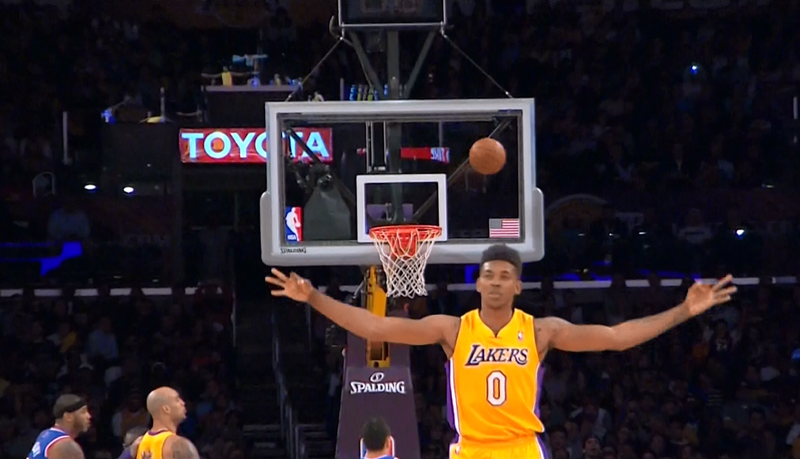 So long, So Right; Hello, Swaggy P! An NBA team is required to have between 13 and 15 players on its roster. However, it may proceed with only 12 players for up to two weeks. The (K)N(I)(Y)(C)(H)(K)S have reached the necessary homonymous 12. During the two-week grace period, Shane Larkin will be given the option of becoming Shane Larnik, just as Cole Aldrich will be given the option of becoming Cole Aldnich. The rest will be waived, and the team may consider filling out the roster with Euro ballers Nik Caner-Medley (free agency), Nik Fazekas (free agency), Nik Ivanovic (2015 draft eligible), Dominic McGuire, and/or D-Leaguer Nick Barbour. TEAM OWNERS: It is possible that the Kingdom of Homonymy, being better than our world, will not have team owners. But if it does, I have it on good authority that New Yorker Nicki Minaj will own a controlling stake and sit courtside at all home games. Hollywood dreamboat Nicolas Cage will own a minority stake, emphatically represent the team at any draft lottery appearances, and take in the occasional game seated next to Ms. Minaj and pop sensation Nick Jonas, who will be allowed entry without so much as a ticket. COACH: Derek Fisher will be given the opportunity to change his name to Dernek Fisher. Otherwise, the job will go to Nick Van Exel, presently an assistant on the Milwaukee Bucks, and always a Nick. TEAM DAD: Many of you may fondly recall sucking on orange slices at halftimes of your youth soccer games. Some benevolent parent brought them for your refreshment. Why should our sports heroes not receive the same pleasure? For that, they need a parent. Enter Yiannick Noah, Team Dad. GOOD LUCK CHARM PERSON: Is it possible that Nick Anderson’s missed free throws in the 1994 Finals are not a curse that afflicts the Magic but rather a dark magic afflicting the (K)N(I)(Y)(C)(H)(K)S? In our present world, such a person would be made to live a life of exile and loneliness. (See, e.g., Scott Norwood, Steve Bartman, Bill Buckner, the Chicago Cubs goat.) However, the Kingdom of Homonymy recognizes our shared humanity/goatness, and embraces the figurative and literal goats as GOOD LUCK CHARM PERSONS. Welcome back to Madison Square Garden, Nick Anderson, and, more importantly, welcome to the New York (K)N(I)(Y)(C)(H)(K)S! Remember those youth soccer games I mentioned above? You need not think back to soccer specifically, but really to any youthful collective venture, though preferably one in which a doting parent provided orange slices. Remember when your coaches or parents would tell you that it’s ‘all-for-one, one-for-all,’ possibly to prepare you for the first time you read a bottle of Dr. Bronner’s? That is what it means to be a (K)N(I)(Y)(C)(H)(K). Each individual is subsumed into the greater whole, just as that greater whole becomes each individual. The result is a pleasant, peppermint tingle that lets you know it’s working. Having been offered this opportunity by the whimsies of language, the benevolence of the universe, and the clarity of the vision that visited me as I lay drunk one night in my garage, we have no right to turn it down. Let us create a better world; Let us enter the Kingdom of Homonymy; The time is now for the New York (K)N(I)(Y)(C)(H)(K)S!